For most Russians, the island of Kizhi is the epitome of medieval wooden architecture: using no other tool but the carpenter's axe, unknown craftsmen created masterpieces of world architecture. Therefore, it is no wonder that the architectural ensemble of the Kizhi church complex (known as the Kizhi Pogost) was one of the first Russian sites to make the World Cultural Heritage list by UNESCO – to be more exact, it was second after St. Petersburg and its suburbs. The Kizhi Pogost became one of the top attractions of northwest Russia and is a must-see item on the tourist and cultural agenda of all those visiting the capital of Karelia. 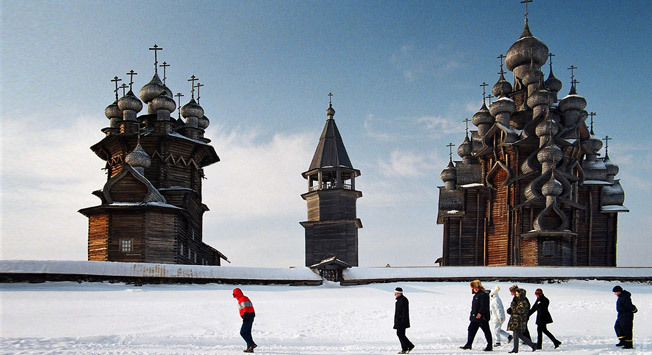 The preservation of the Kizhi Pogost became the premise for the creation of Russia’s first open-air museum: the Kizhi State Open-Air Museum of History, Architecture and Ethnography. Encompassing 10,000 hectares, the museum safeguards 76 ancient wooden buildings, including the Church of the Resurrection of Lazarus, the oldest in Russia, and about 500 beautiful icons. It is located on one of the 1,650 islands of Lake Onega and contains a wharf, a wooden boardwalk, two kiosks and footpaths connecting the church to a house and the house to the mill: these footpaths can be used to get around the entire island (5 kilometres long and up to 500 metres wide), lost among many other similar islands and islets scattered in the northern part of the lake. Lake Onega is the second largest lake in Europe after Lake Ladoga. It was formed 12,000 years ago when the northern hemisphere was being cleared of ice sheets during the last glacial period. As the kilometre-thick glacier retreated north, it carved deep furrows into the crust of the Earth, which were then filled with meltwater, while the protruding ridges became numerous islands. Once the glacier retreated north, the first people came to the area. On the rocky eastern shores of the lake, scientists discovered petroglyphs, testifying to human presence here as early as the 2nd-4th millennium BC. Between the 11th and 15th centuries, these lands were part of the Principality of Great Novgorod. In 1478, the Novgorod lands were annexed to the Moscow State. During World War II, these parts fell under the Finnish occupation. But in 1945 the Kizhi Pogost, along with a few peasant dwellings left over on the island, was declared a national sanctuary. In 1951 Oshevnev’s peasant house was moved to the island from a neighbouring area. From that point on, a number of other exhibits have been transferred to this museum of wooden architecture. In 1994, after half a century of inactivity, Orthodox services resumed at the Kizhi Pogost’s Church of the Intercession. The island’s main attraction is the Church of the Transfiguration, built in 1714. It is 37 meters high, featuring 22 church domes of different sizes arranged in a tiered cluster, all reaching towards heaven. The old masters achieved an astonishing effect: if you stare at the domes long enough, you get an impression of upward movement. This optical illusion results from the relative sizing and positioning of the domes along two adjacent verticals: they increase in size along one and decrease along the other. An additional marvel is that the church is built, as they say, without a single nail. In fact, the structure does contain a few small nails, but they function solely to affix planks to the domes, each plank held by a single iron nail. Seen from below, the domes seem covered with scales drawn with age-old patina. Aspen, from which they are made, possesses a remarkable property: it does not crack from rain or sun. The base of the church measures 20 by 29 metres and was made out of high-density pine, grown on very dry soil and therefore very resinous. Logs were cut with an axe and a chisel with utmost precision; metal saws, while already known at that time, were never used in the process. Unlike sawing, sharp cuts made with an axe do not tear the wood, thus not allowing water to seep into it. Another interesting visual effect characteristic of the church is that it looks the same from any angle. Even more surprising are the techniques used by the Russian masters to render the wooden structures extra durable and resistant to rain and moisture. Upon tracing the path of a raindrop falling from the cross of the central dome onto a lower dome or slope of the roof, it becomes apparent that many of the decorative elements are in fact purely utilitarian, designed to protect the church building from penetration by moisture. Even if a bit of water makes its way somewhere under a section of the roof, there is a another gable roof underneath it, fitted with a layer of birch bark, where a trough positioned under the joints contains a chiselled sloping tray that drains out the liquid. The island features a total of 89 monuments of Russian wooden architecture of the 15th-20th centuries. A standard guided tour of the museum-island takes three hours. The “scaly” roofing bits (called lemekh) covering the domes are made of carefully selected aspen, which should be neither too young nor too old. The most seasoned carpenter can make thirty wooden bits in one day – so that making enough for one church would take about two years. And now consider the volume of work required for twenty-two domes. In 2014, the grand-scale restoration works on the Church of the Transfiguration will be completed. Some 20-30% of the logs need replacing. The reconstruction is carried out using the authentic ancient lever device, called vag; this is exactly the same technique that was used 400 years ago.